Portable Weigh Pads is made of stainless steel or aluminum alloy. Underside there is several entire sealed and thin sensors embedded in the plate. Our clients can avail from us an extensive range of Tank Weighing Systems, which is widely acclaimed for easy installation, high accuracy and calibration. These weighing systems are used to weigh the exact amounts of solid and liquid material, which is filled or discharged from industrial hopper, silos, bunkers, tanks and mixers. Our range is available in different types, which includes crane weighing systems and milk weighing systems. Introducing the third generation Portable Axle Weigh Pad. Remembering, regularly developing prerequisites of our profitable customers, we are putting forth a selective range of Portable Axle Weigh Pad. Enjoy all the benefits of Massload highly successfully Ultraslim Weight pad, now with an integrated digital readout! Forget about running wires, or having to tote around a wireless receiver, this readout is ready to weigh as soon as you lay it on the ground. The electronics are specially designed for the weighing industry and are sure to give you hundreds of hours of operation. 3 AA batteries power this pad, and the weight is displayed on a highly visible 1" high LCD screen with 5 digits. A sealed 5 key, keypad make this pad very easy to operate, and a security sealed calibration switch ensure that your pads will not be tampered with. With 20 independent micro load cells in each pad, this is our most sophisticated pad ever. Available in capacities up to 20 tons per pad! Machined from lightweight, high strength aluminum. 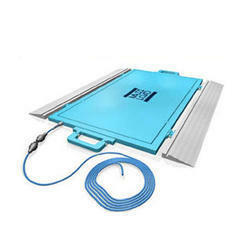 We offer a durable range of Portable Weigh Pad. The bright orange industrial paint is baked on to the aluminium alloy chassis. It can even accommodate for virtually any vehicle's axle arrangement with the simple use of plates. No Civil Foundation is required. Low Profile with built in Ramps. Light in weight, and convenient transportation. Integrated design, self-weight less than 25 kg, easy to move. Can be used as a Cross Checker for Weighing. Model approved by Weights and Measures department. Suitable for Industrial applications such as Axle Load Survey, Mines, Ports, Automobile Industries etc. After Sales support over 86 locations across the country. 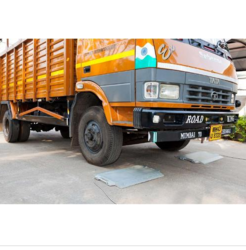 Owing to our immense expertise in this domain and vast industry experience, our firm has been capable of manufacturing, supplying and exporting Portable Axle Weigh Pad. With the help of experienced professionals, it is manufactured using qualitative components and integrated with efficient sensors. These sensors enable to calculate the exact weight of the vehicles laid on this pad. 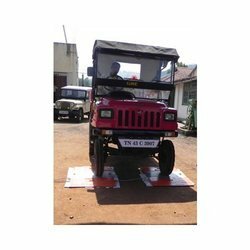 We timely deliver our Portable Axle Weigh Pad at the premises of our clients within given time-frame to ensure clients' optimum satisfaction. Looking for Portable Weigh Pads ?